I want to read high voltages, like ~50V, using a microcontroller. I plan to put this as an input into the microcontroller's A/D line. But of course, you shouldn't have voltage that high on the input of a microcontroller or it'll fry. How might I read high voltages? The main thing is that I need to step down the voltage before reading it. What do I need to consider when stepping down this voltage? Edit: I noticed in the PIC18 datasheet that it says "The maximum recommended impedance for analog sources is 2.5 kOhms." How does this affect how I step down the voltage, be it with resistive dividers, etc.? A simple resistive voltage divider will achieve what you want. For an ADC requiring a maximum source impedance, you must make sure the voltage divider impedance is below this level. The impedance at the divider can be calculated as R1||R2. In these cases it's best to use an opamp buffer in between a high resistance divider and the ADC. Or use a 2kΩ and 18kΩ divider, which is not quite as power hungry as the 1k/9k version. The Schottky diode protects the opamp's input against overvoltage in case the input voltage would exceed the maximum specified 50 V. This is a better solution than the 5 V zener which is often placed in parallel with the 3 kΩ resistor. The 5 V zener voltage requires several mA, if the current is much lower the zener voltage will be lower as well, and the diode may clamp the input to for instance 4 V, or even lower. The 27 kΩ resistor will allow 2 mA, isn't that enough for the zener? I might, but that's not what the zener will get; most of that 2 mA will pass through the 3 kΩ resistor, leaving only tens to hundreds of µA for the zener, which simply is too little. Select a Schottky diode with a low reverse leakage current, so that the 5 V supply voltage doesn't influence the divider too much. For an isolated measurement, you can use a voltage transducer, e.g. LEM's LV-25 or similar. To fight your source impedance problem you could first use a voltage divider and then use a standard opamp. That should have a low enough output impedance for you. Here's an app note I posted yesterday on using opamps for converting voltage levels for ADCs. Look up something called a resistor divider. 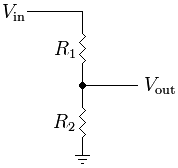 Using two resistors, you can multiply a voltage by a constant between 0 and 1. In your case you want to scale 50 V down to the microcontroller level. Let's say the micro is running at 5 V, so you want to scale the input by 0.1. This could be done with two resistors, the first having 9x the resistance of the second. The signal goes into the first. The other end is connected to the second resistor and the micro A/D input, and the other end of the second resistor is connected to ground. With the 9:1 ratio you get a gain of .1 (attenuation by 10). You probably want the lower of the two (the 1x resistor) to be around 10 kΩ, which would make the other 90 kΩ. I'd probably use 100 kΩ to provide some margin and overrange sensing. I've successfully done this using a voltage divider and a Zener diode reverse biased between the input pin and ground (just in case). Not the answer you're looking for? Browse other questions tagged microcontroller adc high-voltage or ask your own question. How do I measure a voltage greater than 5 V with Arduino? PIC - How to skirt around low maximum ADC input impedance? 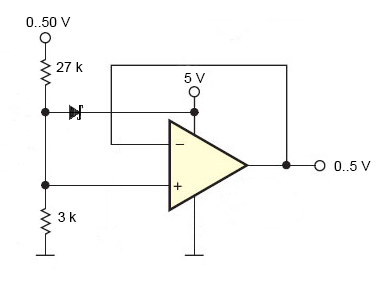 Converting 0 to 24V analog signal to 0 to 5V for ADC input? Does this circuit have proper isolation? how to separate a analog sine wave to positive and negative using ADC and DAC?